Tom Petty is hot these days. In the wake of "Full Moon Fever," the best-selling album of his career, and given his tenure as the youngest Traveling Wilbury, Petty is flying high. Yet this turn in Petty's commercial fortunes comes not so many years after a time when it seemed as though he and the Heartbreakers would have to journey to the desert to get hot. After the breakthrough success of "Damn the Torpedoes," in 1979, the group produced a series of distinguished albums that nonetheless seemed to sell progressively fewer copies. 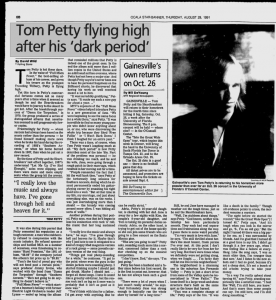 Frustratingly for Petty -- whose success had always been based on the music rather than the persona -- he found himself making more news when he broke his hand during the recording of 1985's "Southern Accents," or when his home burned down in 1987, than when he put out a new record. By the time of Petty and the Heartbreakers' last effort together, 1987's underrated "Let Me Up (I've Had Enough)," sales were slipping, and there were more and more empty seats when the group hit the arenas. It was also during this period that Petty cemented his reputation as a tough customer, a man who stubbornly refused to compromise with the music industry. He refused sponsorships and battled MCA on a number of occasions, even threatening to rename "Hard Promises," the 1981 album, "$8.98" if the company jacked the album's list price up to "$9.98." "Tom's the kind of proud guy will will not bend past a certain point," says producer Jimmy Iovine, who worked with the band from "Damn the Torpedoes" through "Southern Accents." "He's not going to do anything he doesn't believe in." "Full Moon Fever" -- which started as a busman's holiday with former Electric Light Orchestra leader Jeff Lynne -- ended up being the album that reminded millions that Petty is indeed one of the great ones. In the end the album sold more than 3 million copies in the United States and an additional million overseas, where Petty had not been a major star. And though Petty says he's never been one to base his personal happiness on the Billboard charts, he discovered that having his work so well received meant a lot to him. "It was incredibly gratifying," Petty says. "It made me such a nice guy for about a year...."
MTV's exposure of the "Full Moon Fever" videos helped introduce Petty to a new generation of fans. "We were beginning to see the same faces for a while there," says Petty. "It was incredibly to find so many young people who didn't know anything about us, or me, who were discovering the whole trip because they liked 'Free Fallin'' or "I Won't Back Down.' I think I laughed for an entire year." There was a time, of course, when Tom Petty wasn't laughing much at all. "My dark period" is how Petty describes most of the late '80s. Part of the problem was personal -- he was drinking too much, and he and his wife, Jane, were going through a rough patch in their marriage, with resulted in her moving out for a time. "People remember the fact that I hit the wall back then," says Petty of the tortuously long sessions for Southern Accents, during which he almost permanently ended his guitar-playing career by smashing his right hand into a wall. "But at that time in my life, my marriage, and just about everything else, was on the rocks. I was just overindulging more than I should -- the brandy was coming around more often. I was hitting all sorts of walls." Another problem during that period, Petty says, was that he'd begun to lose his connection with rock 'n' roll, the music that had long sustained him. "I really love the music and always have," he says. "I've gone through hell and heaven for it. Maybe that's why I just hate to see it relegated to a kind of crappy Mad magazine version of a rock group -- some juvenile cartoon version of the real thing. "Things got real phony-sounding for a while," he continues. "It got to the point where even the guys in the denim jackets were sounding phony. I started thinking maybe I should just get drunk. Maybe I should just ... forget all these songs. I hate to sound like a grouchy old-timer, but the reason rock isn't as big as it once was is probably that it isn't as good as it once was." "You'd think with him for a father, I'd get away with anything. But he can be really strict." Adria, Petty's 16-year-old daughter, is chatting with her dad. Jane is away for a few nights with Kim, the couple's 9-year-old daughter, and Tom is taking his parental duties seriously. Adria, on the other hand, is trying to get out of the house quickly so she can join some friends who are going to a free concert on the Santa Monica pier. "Who are you going to see?" Petty asks, sounding much more like a normal, concerned father than a rock star checking up on the musical competition. "I don't know, Dad," she says. "I'm just going." Petty has been a husband and a father since before his first record. He is the first to point out, however, that he has not always been such a good one. "There was a lot of years when I just wasn't really around," he says. "And fortunately Jane was strong enough to basically run the whole show by herself for a long time." Still, he and Jane have managed to weather out the tough times, just as he and the Heartbreakers have. "Well, I'm stubborn about things," says Petty. "God knows, neither relationship has been particularly smooth. They each had real separations and frustrations along the way. I guess there is some weird parallel. "I'm still very much in love with Jane," he says. "I'm still thrilled about her. She's the most honest, frank person I've ever met. At this point I don't really like to be very far from her for very long. But there were times when we definitely were not getting along, when we fought .... I'm lucky they still let me live in this neighborhood." The neighborhood is a charming one in the suburban San Fernando Valley -- Petty is just a short drive from some of the Valley spots he immortalized in "Free Fallin'." The house itself is a large wood-and-stone structure that's built on the same spot as the house that burned. "That was a complete change of life," Petty says of the fire. "It was like a death in the family." Though all evidence points to arson, the incident remains a mystery. "The night before we started the record ("Into the Great Wide Open") I turned 40," Petty says. "And it's tough when you look in the mirror and go 'S-, I'm an old guy.' But the night I turned 40 there was a big party for me, so I was surrounded by friends. And I'm glad that I turned 40 at a good time in my life. I didn't go through it a few years ago, when I was feeling like a failure at everything. Like the song says, 'I was so much older then, I'm younger than that now.' And I listen to the new album and I feel so good, because it's not a cheap shot. It's not a bunch of old a-holes trying to take your money. "In a way I'm really upbeat about turning 40," says Petty, sounding suspiciously like a satisfied man. "I feel like 'Well, I'm still here, you know.' And that's more than some people can say. I'm still here, and I'm still doing something."